It was a good week in jazz, especially for trumpets. Friends gave me good reviews of Irvin Mayfield’s New Orleans Jazz Orchestra All Stars at Orchestra Hall. 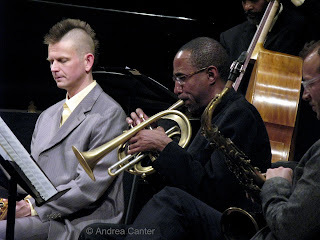 My own adventures included two doses of Denver-based trumpeter Ron Miles. 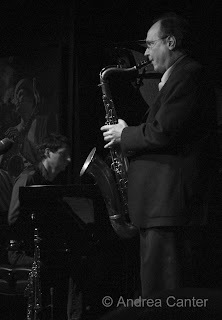 First was his workshop at MacPhail, an informal discussion and demonstration in which he involved several of the students in the audience, who happen to be among the best high school jazz musicians in the area (Joe Strachan on piano, Cory Grindberg on bass, Isaac Zuckerman on drums—75% of the Isaac Zuckerman Quartet.) Miles noted the "beauty of the single line...even Bach!," shared his passion for improvisation ("Play like you don't know what will happen...make it a spontaneous conversastion"), and of course displayed his marvelous trumpeting. And that odd-looking horn! Miles explained that he had focused on cornet in recent years, and moved on to a specially designed horn from famed trumpet-maker David Monette, whose customers have included Irvin Mayfield and Kelly Rossum. Miles’ horn looks somewhat like a squashed flugelhorn but it sings like a tropical bird in flight (in the odd key of G). The next night Miles was the guest artist for the always-adventurous Jazz Is Now “Nownet” ensemble, led by composer/pianist Jeremy Walker and a spawning ground for new compositions. For this night, two hot trumpets were featured—Miles and local hero (soon to be New Yorker) Kelly Rossum. But the full ensemble shined—Walker, saxmen Chris Thomson and Scott Fultz, bassist Anthony Cox and drummer Kevin Washington. Together they form what has to be one of the nation’s most formidable composer collectives. Trumpets again were in the spotlight Saturday night when Nicholas Payton blew in to perform with the JazzMN Big Band, a very nice way to spend Valentine’s Day night. Payton even sang on his original tribute to New Orleans and traded bars with the JazzMN trumpet line—and in no way were the talents of Jeff Gottwig, Steve Strand, Dave Jensen or Adam Rossmiller (or briefly bandleader Doug Snapp!) diminished by Payton’s presence. This was a stellar horn quintet! And speaking of horn quintets, the first set of the evening reunited the Hornheads, an all brass ensemble of performers/ composers/ arrangers led by trombonist Michael Nelson, along with Dave and Kathy Jensen, Steve Strand and Kenni Holman. Nelson just returned from handling arrangements at the Grammy Awards. The word is out—great horns come from Minnesota. But there were other examples of “top brass” aside from the trumpets. Friday night was a rare opportunity to hear sax specialist Pete Whitman in a small ensemble context when he brought his quartet to the Artists Quarter—with Peter Schimke, Jay Young and (again!) Kevin Washington. They opened with an abstract arrangement of “Footprints” and during the first set covered Pete’s composition “written for a beautiful woman” – partner Laura Caviani. Like a select few of the small ensembles in the Twin Cities—Phil Hey’s Quartet comes to mind—Whitman and crew exude collaboration, finesse, and inventive improvisation. It’s an artistry that has always marked Whitman’s larger band, the X-Tet, and one that is fully satisfying pared down to four voices. Sunday was the annual Witness program of Vocalessence, the celebration of African-American history and culture set to music. The first half of the program featured a full orchestra and the choir, along with readings from Minneapolis middle school students and narration from T. Mychal Rambo. For the second half of the afternoon, Vocalessence welcomed the Billy Taylor Trio. A decade ago, Taylor wrote “Peaceful Warrior” in tribute to Dr. Martin Luther King, performing with Vocalessence, so this was a reprise. Interesting, although Taylor mentioned that the composition was even more meaningful with the election of Barack Ombama, there was no mention of the first African American President throughout the entire Witness program. “Peaceful Warrior” in three movements was the mainstay of Taylor’s trio performance. Despite a stroke that weakened his left hand in 2000, the 87-year-old Taylor played with sufficient swing and dexterity to enliven the melodies and support the soloing of his very accomplished cohorts, Chip Jackson on acoustic bass and Winard Harper on trapset. Harper, one of my favorite drummers to watch as well as hear, did not disappoint; to a degree he upstaged the leader with his smiling antics, flaying sticks and brushes like a graceful dancer and dramatically leaping spread-eagled to dampen the cymbals, all the while displaying a joyful grin. To Harper, playing drums is akin to running loose through a candy store. Sitting six rows from the stage precisely across from the drum kit, I too was a free soul in fantasy land. I probably had a similar grin. 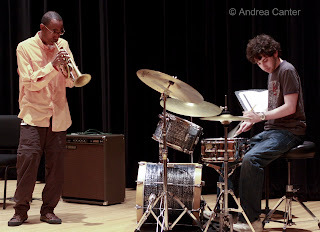 Photos: (Top), Ron Miles accompanied student drummer Isaac Zuckerman at his workshop at MacPhail; Miles soloed with the Jazz Is Now Nownet; Pete Whitman with Peter Schimke at the AQ. Photos by Andrea Canter.